What a great start to the year! On New Year's Day I often visit Banyule and Wilson Reserve, in an attempt to get the year's birdlist off to a good start. This year I didn't. These treats are still in store for me in 2016. But I ticked a lifer in January, something I don't often do, and what better start to the year could there be? Apart from seeing the poor lost Paradise Shelduck at Lake Wollumboola, I spent a very pleasant hour at Trin Warren Tam-Boore (while Rog was at one of his interminable doctor's appointments) and visited Werribee twice. Yes, I did see the Red-necked Phalarope, not very good views, but I saw it. Better, I saw some great interstate birders who'd come to see the phalarope. Three species of crakes put on a delightful display and Werribee was as wonderful as only Werribee can be. We saw thousands of ducks, but dipped on the Brolga. 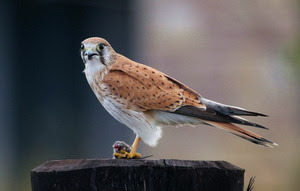 We saw many raptors, but came home without a kestrel. We had four species of terns and lots of waders. The avocets were as elegant as ever, Banded Stilts overshadowed their smaller cousins and the Cape Barren Geese impressed everyone. We had superb views of Little Grassbird, Striated Fieldwren and Australian Reed-Warbler. I enjoyed the Brown Songlark and I always love zebbies. One single Dusky Woodswallow greeted us on both our visits. This despite the rain. It seems to rain less at Werribee than it does in Melbourne. Often I leave a wet Melbourne and enjoy a pleasant dry day at Werribee. This year, both my visits so far have been wet. I managed 30 daily walks in January, seeing a total of 26 species. I saw an average of 11 species on each walk: the most was 16 and the least was 8. I added just one new bird to my daily walk list. It was a Little Eagle. The Rainbow Lorikeets drew my attention to it, with their ear-piercing screeching. It was quite high in the sky, seemingly oblivious to the noisy lorikeets. 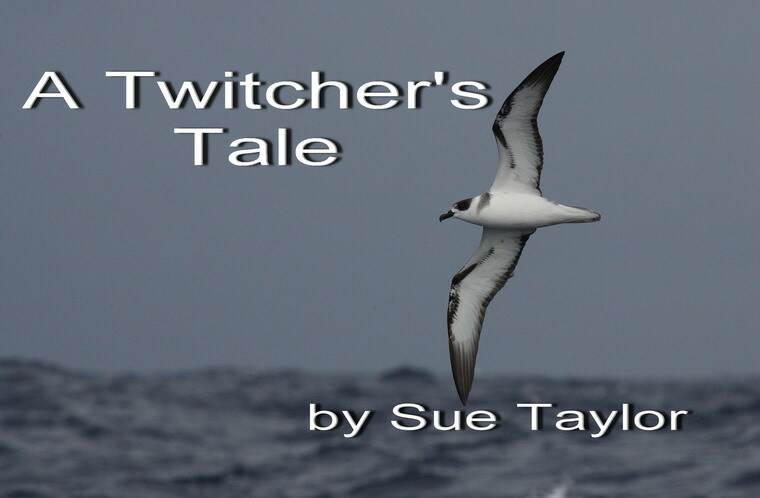 In February, I plan to make yet another attempt on my last remaining bogey bird: the White-necked Petrel. This is supposedly the easiest seabird on the Australian list that I have not seen. I have driven (or, more correctly, Roger has driven) to New South Wales on at least a dozen occasions in an attempt to add this bird to my lifelist, but so far have had no luck. Perhaps 2016 will be my year. What a great way to start 2016! In January 2015, Lake Wollumboola presented me with a White-rumped Sandpiper. Now, in January 2016, it has miraculously produced a Paradise Shelduck. Twitchers had gathered at the lake (located near Nowra in New South Wales) to admire a Hudsonian Godwit. For several days they overlooked an aberrant shelduck amongst the teal. Then someone noticed that it was in fact a Paradise Shelduck from New Zealand. HANZAB records that some Paradise Shelduck were seen on Lord Howe Island in 1950. There are no previous confirmed mainland records. I heard about the shelduck last week, but decided I did not want to drive that far alone. (My computer told me it was a little over 8 hours' drive.) James Mustafa (who had driven up to see the Hudsonian Godwit, and noticed the odd shelduck but not paid it sufficient attention) said he was free on Monday afternoon. We set off at 3.15. We spent the night at Goulburn and recommenced our journey at 5.15 on Tuesday morning. We were at Lake Wollumboola at 7.30 a.m. It was raining, but we did not let this dampen our spirits. A group of men identified themselves as birders by their cameras and binoculars. They were standing, chatting under umbrellas, on the lake's edge, quite near the car park. We rejoiced. This must mean the shelduck was very close by. We donned rain jackets, grabbed the scope, and hurried to join them. No, they said. The duck was at the far end of the lake with the swans. They did not know where the hudwit was. We didn't bother to ask them why they were standing under umbrellas by a lake on a rainy Tuesday morning. We set off immediately towards the swans. It was then 7.45. The rain hit our faces unkindly. My precious notebook, inside my supposedly waterproof jacket pocket was soon quite wet. So was I. We skirted the nesting Little Terns, and tried to think positive thoughts. I told James that, in circumstances like these, when I was with my father, he would recite poetry for me. He'd learnt Browning's The Pied Piper of Hamelin as a child and had never forgotten it. I also remember a ballad about Inch Cape Rock. And others. Surprisingly, James remembered some very beautiful poetry. I had not expected that. And it certainly took my mind off my wet feet, wet clothes and the heavy wet tripod I was lugging along for company. We had our heads down, trudging into the rain. 'The rain will be behind us on the way back,' said James cheerfully. I needed my entire concentration just putting one wet foot in front of the other. I could not think of anything suitable to say and did not respond. Suddenly James stopped. 'Look,' he said, grinning stupidly. The Paradise Shelduck was grazing happily, not 100 metres in front of us. It was in company with some Grey Teal, a long way away from the swans at the far end of the lake. It was 8 o'clock. Really a very easy twitch. We retreated to the cover of some nearby scrub. I was happy with my January lifer. James attempted to get a bit closer, using the scrub as a shield. The teal soon flushed. The shelduck honked, but did not fly. James took a photo and then left the shelduck in peace. Really, a fantastic start to the year. Can 2016 continue this high standard?